The week before last I was on a mission to find some sundae glasses for work and had seen some in the British Heart Foundation shop, unfortunately they'd been sold the day before but while searching I clapped eyes on a gorgeous tea/coffee pot with delicate blue flowers priced at £5 which is beyond my usual charity shop limit, but it was so pretty! So after dithering for 20 minutes and having a thorough search through the rest of the shop I turned back to see someone else giving the coffee/teapot a thorough examination then turning up her nose when she spotted 'czechoslovakia' on the bottom, my heart stopped for a moment and then came a huge wave of relief and I raced back to the teapot and seized it far quicker than is socially acceptable! On arrival at the till I was told the £5 price tag also included two trios in the same pattern which the ladies couldn't fit onto the shelf - cue me grinning like an idiot! I'm handing over my fiver when another volunteer came rushing out of the back carrying four more tea plates and a dinner plate in the same pattern saying 'Don't forget these, they go with it!'. At this point I had to laugh and make sure the whole lot was £5 which they assured me was the right price, so I popped an extra donation into the box and left the shop a very happy Jem! One of the two trios that came with the set. A sweet little flower inside the cup! All set for tea with the little battered milk jug I bought from the Salvos (Salvation Army) for 25p and a Twinings herbal infusion. 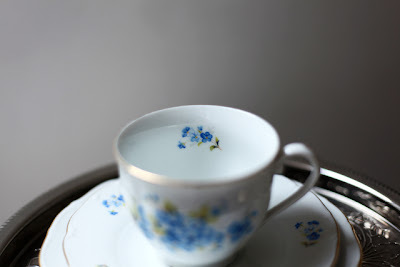 This week I'm joining the lovely Terri and Martha once again for Teacup Tuesday - both lovely bloggers with gorgeous teacup fancies of their own! 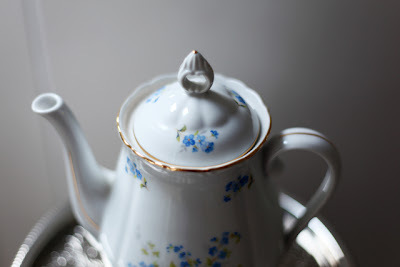 I'm also linking up to Lady Katherine's Tea Parlor for Teatime Tuesday - her spring tea scape is so bright and cheerful and Wanda Lee of The Plumed Pen and The Silken Purse for Tuesday Tea For Two. If you can't get enough of china you might want to pop by Rose Chintz Cottage too. what a great bargain! precious! love your dishes!.. I absolutely love the pattern on the teapot!! Blue is my fave color!! you hit the jackpot when it comes with the trios for £5!!! I know they put that kind of price here in my charity shop for a teapot but i've never got the extra teacups and saucers for that hehehehe....Lucky you!!!! and love the milk jug you got too! it's sooo cute!!! Jem - that is so beautiful and delicate. You must have been delighted to find it came with other bits and bobs. What a find! What an amazing bargin, love the pattern! Did you find some sundae glasses? I spotted a box of 4 in Morrisons yesterday for about £4. Oh my stars, Jem. That is a bargain and a half. They are utterly beautiful. oh wow,possibly the best bargain ever!!! 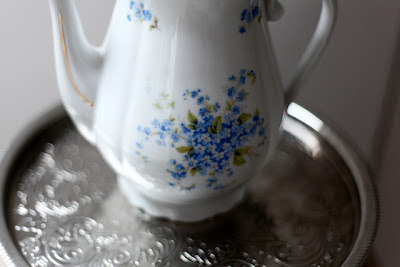 the tray youve popped the teapot on is totally fab too,love it! I love china decoration in blue. And your tea cup and pot are so beautiful! Thanx for sharing. How fab! A great find. How I do miss the UK charity shops...they are certainly different here in the USA. Wow! What a wonderful surprise for you, Jem! I love the teapot; so pretty! How nice that you have all the pieces to go with it too. 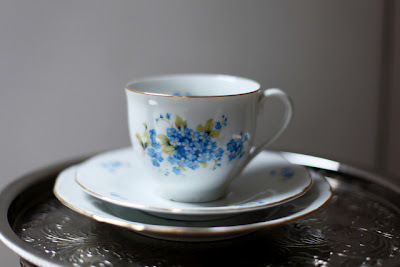 Thank you so much for sharing your pretties with us and thank you for joining me for my Spring tea party. It's been a pleasure having you. I'm your newest follower. Happy Spring! Jem...tell me you went out and bought a lottery ticket too! You are one lucky girl! I can not believe what you got for 5pound! The tea pot is adorable cute, as well as the sweet cups and saucers. May your luck continue with you all your days. I love the charity shops in England, I always find good things there and they price well too. I love hearing about your fabulous finds! 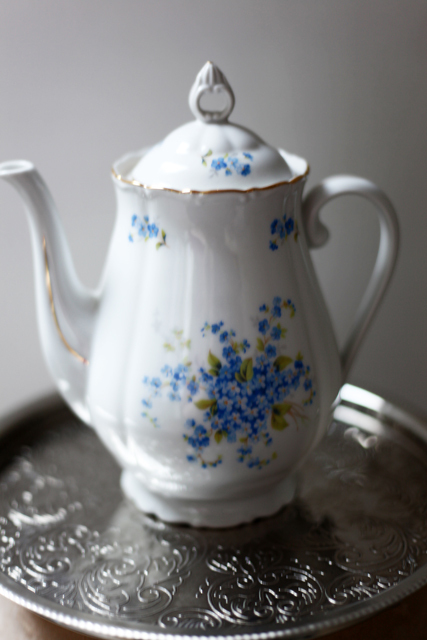 What a pretty teapot, teacups and saucers; thanks so much for sharing this delight with us! Thanks for joining Pam and I for TTTT and also for my 75th, 'Tuesday Tea For Two'! I love your tea set. It is gorgeous!! I didn't know there were other tea cup lovers like me! Or something called Teacup Tuesday. Blog Land is full of surprises. I am mad about tea things - and have started a little collection. Always keep my eyes open when I do the charity shop rounds. I've also noticed other people snubbing things from Czechoslovakia but there's some lovely things from there - well worth buying. Hi I saw your lovely Tea/coffee pot on Coastal Charm and I am so glad I stopped by to take a better look. What a blessing to get not only the teapot but all the other items too. It is beautiful and I think you showed real restraint by waiting till the other lady put it back down instead of snatching it out of her hands. LOL! What a great buy. What a fantastic story! Such a beautiful pot and tea cup!!! Wow!! It's so gorgeous!! So is the little cup! You really got an awesome deal...thanks for sharing it at NTT!!!! What a wonderful find! Your tea set is so pretty with its beautiful blue flowers. Lucky you! what a great bargain and a beautiful and dainty pattern in these pieces!! Nice to find you! It seems like your bargain was meant for you - what a nice suprise and pretty forget-me-nots! If your weather is like ours you won't be having the sort of wet day you enjoy so much! Hi lovely lady. I love your Tea Party so sweey !! 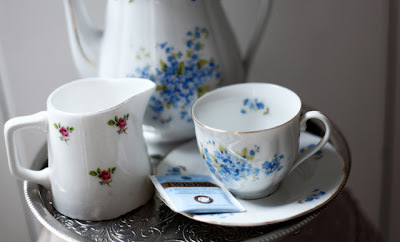 I need to do a Tea Party table some time on my Tablescapes looks like fun ~~~ I need to do it in my Rose Garden. I hope you have a Great week sweet lady.